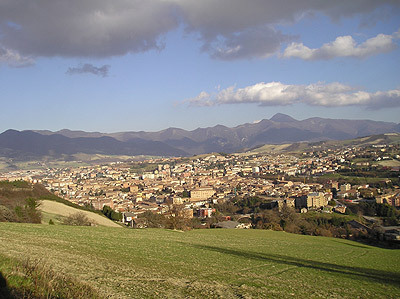 The name of this beautiful locality that border on the Umbria region seems to derive by Faberius, owner of a property in roman age. Fabriano instead rose thanks to the barbaric invasions of Goths leaded by Alarico and Longobards leaded by Desiderio. It seems that in 411 d.C the Roman inhabitants of Attidium (Attiggio) running away by invaders founded the first nucleus of Fabriano: the Castelvecchio Castle (subsequently erected in 800 a.D.). The two castles Castrum vetus and Castrum novum, original place of the city, passed in the Longobard Reign until the invasion by Charlemagne who determined its end (773). The Middle Ages saw then the fusion of the two castles (1000) and expansion of the defensive system with the construction of a new town-walls building, towers and castles. In 1234 Fabriano became Comune knowing a period of development both in arts and trades. Subsequently it knew the fights between Guelfi and Ghibellines for the power and became lordship of the Ghibelline family Chiavelli (1378) until 1435 when it passed to Sforza family for few years and finally to tthe Church (1444) that it kept it for centuries till the date of September 16th 1860, date that marked the passage of Fabriano to the Reign of Italy with a plebiscite. Fabriano is an art city and it demonstrates it with its intact medieval aspect made of alleys and ancient walls and through the presence of its most famous monuments: the splendid Palazzo del Podestà (1255) and the Fountain Sturinalto (1285), the San Francisco Loggia (1450) and the Cathedral of San Venanzio, that keeps numerous baroque paintings, l'Ex ospedale di Santa Maria del Buon Gesù. Sadly many monuments do not conserve anymore their original structure but are XVIII cent. remakes followed to the big earthquake happened in 1741. Fabriano links its image in Italy to the production of the paper illustrated inside the Museo della Carta (Paper Museum). The art of production of the paper arrived from Damascus (1264) but it was only thanks to the techniques of improvement discovered in Fabriano that the product soon spreaded all over Europe giving importance to the medieval city and well-being. After a period of decline Fabriano paper mills flourished again in XIX century thanks to the Peter Miliani's work.